Dart from Pacific Seeds , a new late-planted Australian Prime Hard wheat variety is now available for wheat growers in Queensland and northern New South Wales. With Dart making the jump to APH, Pacific Seeds now has five APH varieties available to farmers including Burke, Gregory, Crusader, Spitfire and Dart. The latest APH variety will be available from spring onwards. Bred by LongReach Plant Breeders and trialled as LPB07-1325 from the time it was first entered into the National Variety Trials in 2010, Dart has been extensively evaluated by the LRPB technical team and has also found an early following among farmers and seed suppliers. 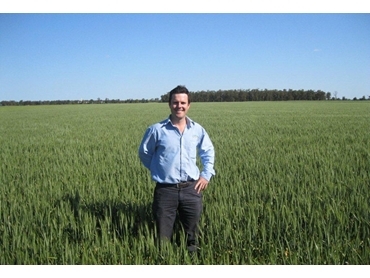 Angus Woods of Goondiwindi-based seed producers Woods Seeds has experienced his first season growing Dart on one of the group’s farming properties, Billa Billa. He believes that Dart is a good fit for Queensland, especially in the west, and northern New South Wales because it can deal with a tough finish or late start. Mr Woods explains that growers in these areas are looking for an APH variety that not only offers marketing options, but also a flexible planting window to combat unforeseen climatic events. PH wheat, he said gives the farmer more marketing options and a premium price, but the added bonus of a quick crop allows the farmer to plant later, account for a late break in the rain or re-gather after a failed crop. A solid rust resistance package was another important element during Billa Billa’s winter. Mr Woods adds that Dart has improved stripe rust resistance, offers very good resistance to stem and leaf rusts, and is one of the few wheat varieties with good yellow leaf spot protection. The 12,000-hectare property has played host to an array of crop trials for chickpeas, barley, sorghum, mungbeans and wheat, so Mr Woods was on the lookout for suitable protein accumulation and yield, especially considering the minimal in-crop rain last winter. He said that Dart pretty much equalled the Gregory APH variety in terms of yield on their farm with 2.9 tonnes per hectare and 14% protein. Mr Woods timed his 80-hectare plant for the second week of June, using a double disc Boss Engineering planter configured for 30cm row spacing and a 50kg/ha seed rate to get the job done. The best time to plant this variety is mid-May to the start of July. On the Billa Billa farm, Dart was quick to come out of the ground, showed early vigour, escaped the frosts and maximised its yield potential. Dart is still classified as AH in central and southern NSW.